Free download True Burner latest version. 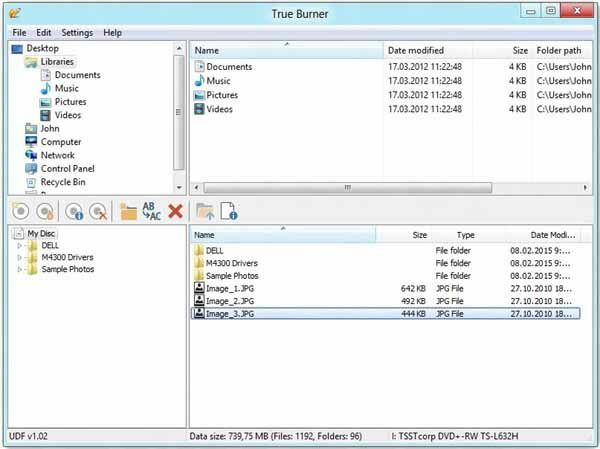 True Burner is simple, but powerful free burning software, which enables you to make and burn standard, multisession and bootable CD, DVD, Blu-ray Disc with various file systems, including ISO 9660 and UDF. With True Burner you can create Data and MP3 Discs, DVD-Video. True Burner allows you to create and burn CD, DVD or Blu-ray Disc. You can make standard or multisession CD, DVD or Blu-ray Disc with various file systems or bootable disc. Additionally, you can erase rewritable CD, DVD or Blu-ray Disc.